I really liked Zoho Docs, and if you are a premium user of Zoho Docs, you will surely find it useful, and none of the cons of Zoho Docs is going to disappoint you or is going to be a dealbreaker. However, if you are using Zoho Docs for free, you might not be able to avail all the features. With the blessing of high-speed and reliable internet connections, we no longer need to build very high-end systems to accomplish some heavy tasks, kudos to Software as a Service or SAAS. You can know more about SAAS here. When it comes to editing some office files like documents, spreadsheets, presentations, or something of that sort, we mostly use Microsoft Office. Sometimes, we even rely on some alternatives of it like Apache OpenOffice, WPS Office or so. But, if you are always connected to the internet, and edit documents, spreadsheets, or presentations quite often, you can even rely on some commonly known SAAS platforms like Microsoft Office Online, Google Docs, Google Sheets, Google Slides, etc. But I recently came across Zoho Docs, which is a SAAS platform that does almost the same job. Just sign up, and start creating documents, share them, collaborate with multiple users, and do almost everything else, which you can do on Google Docs or Microsoft Office Online. After using it for quite some time, and exploring its features, I am really satisfied with the overall performance of Zoho Docs, and I am here to give a brief review of Zoho Docs. 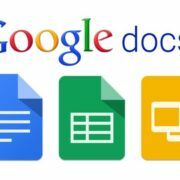 If you are looking for an alternative to Google Docs or looking for a way to edit documents online, Zoho Docs is a good alternative for you. So let’s get started with the features, followed by the pros and cons, and ultimately, the bottom line of the product. Let’s have a look at the features of Zoho Docs, and find out how impressive are they. 1. Talking about the services, which Zoho Docs has to offer, you can create documents, spreadsheets, and presentations with Zoho Docs along with 5 GB of storage for free users. Though you can even get the most out of the platform by paying an annual fee. 2. 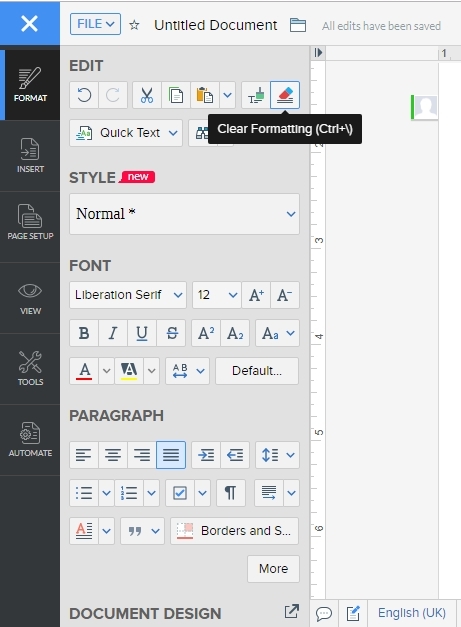 Zoho Writer, which is meant for creating and editing documents, have a plethora of different templates for different everyday situations, which is cool. There is hardly any requirement, you will not find a template for. You can obviously create your own templates in no time. 3. Zoho Docs has support for almost all the functionalities, which Microsoft Office, that is comfortable among many, has to offer. So you will hardly feel missed out if you are looking for a rare feature to finish your assignment quickly in the last minute at your work. 4. Zoho Writer has the support for automating most common tasks with minimum work, which can surely help you to increase your productivity and get the best out of the time you have in your hand. It can be complicated for a few newbies but is a piece of cake, who know about how to use this feature. 5. Zoho Sheets has the VBA editor, which can be useful to create and edit macros that can also be beneficial for automating different tasks on the platform, as well. It isn’t for the beginners but can be a blessing for expert users. 6. All Zoho Docs apps, which include Zoho Writer, Zoho Sheet, and Zoho Show, for creating and editing documents, spreadsheets and presentations respectively support downloading or exporting of the files in different formats, all the users will find useful in their everyday activities. 7. 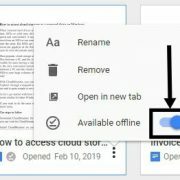 Zoho Docs has support for exporting the documents, spreadsheets, and presentations to different other cloud storage services like Google Drive, OneDrive, Dropbox, etc., which can be very useful if you share your creations quite often. 8. Zoho Docs support effortless collaboration with your colleagues while working on a presentation, report or something of that sort and get the maximum productivity out of your team to deliver the optimum outcome. 9. Just like Google Drive, Dropbox, and other popular cloud storage services, you can even sync the files on your Zoho Docs directly with your PC, and vice versa, which is something most users will definitely find helpful. 10. Zoho Docs has support for versioning, which can help you to easily create file versions, and get back to an older version in no time, just in case something wrong happens with the current version of your document, spreadsheet or presentations, whichever is applicable for you. So those were the few features of Zoho Docs, most users will find in handy. Basic: Free with 5 GB of storage per user. Standard: 240 INR per month + tax per user with 100 GB per user billed annually. Premium: 384 INR per month + tax per user with 1 TB per user billed annually. Now let’s have a look at the pros of Zoho Docs. Can it replace any other platform, which is used for the same type of tasks! The user interface is the first things, which most users pay attention to while using software for the first time. Talking about the user interface of Zoho Docs, it is quite user-friendly, and the menu items are somewhat similar to that of Microsoft Office, if not completely. The Broadcast feature on Zoho Show is quite unique, where you can show a slideshow to some remote users available at a different geographical location. They can ask questions, or have discussions with you, but the control over the presentation and the slides will, however, be in your hand all the time. This can be useful to show presentations to your remote clients or at the time of holding meetings through video conferencing. 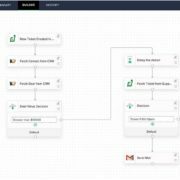 If you use Zoho for CRM purposes, the good news is, Zoho Docs and the files created using it, integrate quite effortlessly with other Zoho products, which can be useful to showcase your creations to your customers, or easily email or share some report or presentation with your colleagues in the most hassle-free way ever. When it comes to security, Zoho Docs offer strong security, which will surely keep your documents and other creations safe on the platform. So just create your documents and forget it. There will hardly be any issues of a data breach with the files stored on the platform. When it comes to saving and opening files to and from other 3rd-party cloud storage services, it can be achieved with just a single click. Just authenticate Zoho with the other cloud storage services for once, and you are ready to save and open files to and from the third-party cloud storage services. 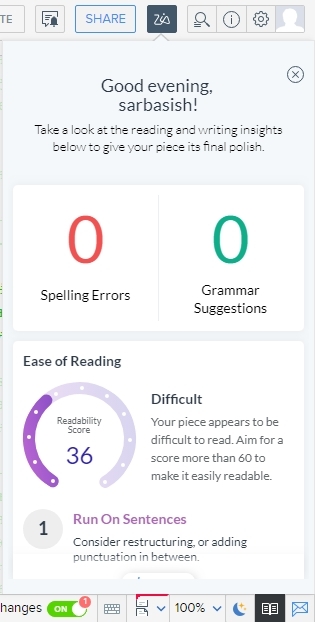 Zia, an assistant, which is available with Zoho Docs can help you improve your writing, by rephrasing sentences, correcting spelling and grammar errors, recommending suitable changes to your document, etc. Zia can also help you rate the difficulty level of your document, which can be useful for SEO and modify the difficulty level of your document to make it suitable for your readers. Zoho Docs has support for a night mode, which can be just too handy if you work a lot at night. This is a small neat feature, which most users will definitely appreciate. The native dark mode that is available for Zoho Docs, isn’t available for other competing platforms, which undoubtedly give Zoho Docs an advantage. Zoho Docs is a premium offering from Zoho, and it offers almost all the things, and the level of customer satisfaction a user deserve, from a premium platform like Zoho Docs. You can easily make that out from the pros of Zoho Docs I have mentioned here. Now let’s have a look at the cons of Zoho Docs, or the areas, where it can improve, be the best premium office suite for all types of users. Though you will easily get accustomed to the tools and the user interfaces offered by Zoho Docs in all its different apps like Zoho Docs, Zoho Show and Zoho Sheet within a very short time, the interface isn’t unified for all the apps in Zoho Docs. Talking about the advanced features of the apps present in Zoho Docs, all Zoho Writer, Zoho Sheet, and Zoho Show is adequate for most personal and small office work or businesses, but isn’t as powerful as Microsoft Office. This isn’t a big con for most users, but is worth mentioning, if you are planning to use Zoho Docs for all your requirements. Zoho Docs don’t have support for additional add-ons or plugins, which is present for most of its competitors like Google Docs or Microsoft Office. At least I didn’t find any option to add or install any kind of plugins, which can be a deal-breaker for some users. But if you are a premium user of Zoho Docs, the personal assistant Zia on Zoho can help you get most of your job done, without any third-party add-ons or plugins. So those were the cons. If you want to try this online cloud document management system after reading this Zoho Docs review, here is the link to Zoho online docs. Now to the final part of the review. I really liked Zoho Docs, and if you are a premium user of Zoho Docs, you will surely find it useful, and none of the cons of Zoho Docs is going to disappoint you or is going to be a dealbreaker. However, if you are using Zoho Docs for free, you might not be able to avail all the features. Though you can still use Zoho Docs for free and avail some of the unique functionalities, which isn’t available on other platforms similar to Zoho Docs. The personal assistant Zia make a number of things possible, which I personally think is the bottom line of Zoho Docs. Hope the review was helpful for you. Do you have anything to say or add about Zoho Docs? Feel free to comment the same down below.